A subluxation of the 1st metatarsophalangeal joint (MPJ) with a deviation of the great toe towards the second with an enlargement of the medial first metatarsal head. Excessive pronation and narrow footwear. Higher incidence amongst women than men. Hereditary factors are listed in some literature. Reddened skin over the base of the great toe. 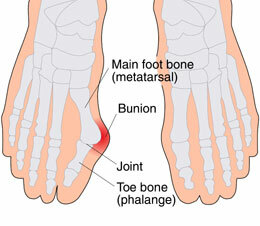 Pain over the joint where the great toe joins the foot (MPJ). If caused by oveprontation, stability or motion control shoe/insert.